So, thanks to Wes’s article, I get the feeling a lot more people will be visiting lanesplitter, as all bikers will be forwarding this to their non-biker buddies. What a great time for me to finish this article eh? I did say I was going to go a little more in depth into the bikes, and why I chose those ones in particular. The second part is availability. its easier to find the bikes you want and the parts them selves are cheap and easy to come by. Who is going to have a cam tensioner for a 1965 Kawasaki? 3 is that these bikes are usually more reliable then the aformentioned 1960's Kawasaki that just broke a cam tensioner. Note that some of the bikes that I mention are a little older and maybe out of production. I still mention them because they are still relatively cheap, modern (all of them can be had post 2007)and plentiful on the market. DISCLAIMER: the prices I’m posted are taken after a quick search on the Toronto Kijiji and Canadian Manufacturers websites. The prices are in CAD, and do not reflect the prices in your area. Some places are higher then normal, some are lower. ”Sport” bikes: These are street bikes that look sporty and handle great. Some even say that they handle better then the full sized 600 and 1000cc superbikes simply because they are so light. they look sporty and these bikes are usually confused with much higher end (and much faster) sportbikes by those who arent in the know. When most people jump into the world of bikes without any prior knowledge or that cool uncle helping them get into it, This tends to be the default choice. With production starting waaayyy back in 1983, it has been sold under numerous names, including EX250, ZZR-250, and of course, ninja 250 R. Off course, with a production run that has gone on for so long, it is easy to find one that suits your budget. As of 2013, the little 250 motor was bumped up to 300CC, with the bike gaining optional ABS and a slipper clutch to help the new guys not crash. Thanks to the huge after market, there is actually a race series for these little guys, so you can keep your first bike! Frankly, not all that interesting. The CBR is hondas foray into the beginner bike market. While they have a LONG history of producing small, cheap bikes, they don’t quite have the reputation of the Ninja. Must be the green. The CBR has also been around for a while, with production starting in 1986. Back then, the CBR had a 250CC FOUR CYLINDER motor that revved to an ASTOUNDING 20,000 RPM. Twenty. Thousand. RPM. My SV650 revs to 11, I cant imagine revving to 20.
then, in 1996, the 250 4-banger got axed. Pity. The 250 took a hiatus until 2011, when it was reintroduced with a 250CC single cylinder, to make day to day riding a little easier, both on the rider and on the wallet. The bike was also released with optional ABS, unheard of at this price point until then. Then, in 2013, the CBR 300 was announced, to better compete with the then announced ninja 300. Where does the little 125 slot into all of this? The 125 was (and remains) the smallest displacement, fully street legal motor cycle you can buy. Rider training schools LOVED the 125's 3K price tag, the famous honda reliability, and the light weight, easy to handle chassis. Prices on the used market do tend to be a bit higher then the ninjas. I’m not going to lie, I was about 1/3 of the way into this article before I remembered this bike exists. The Korean entry to the 250 market. powered by a 250CC V-twin, this little guy is missing a gear from the 6 of the CBR and the Ninja, running all of its power through a 5 speed. No where near as popular as the ninja or the CBR, the GT250R doesnt really have much to offer up against the Japanese 250s/300s, other then a lower price point. Come to think of it, i dont think I’ve ever actually seen one outside dealer showrooms, over then the one GT250 they had at my rider training school. and the clutch on THAT bike was sticking. Not good. Naked: The original naked bike was simply a street bike with all of the fairings ripped off. Now, its more of a style. To be fair though, 2 of the bikes here really are just stripped versions of a different bike. Weird that suzuki has 2 bikes on this list, and even more weird that the badge is the only thing they share! (well, that and the fact that they have been discontinued in Canada) Unlike the 250 single in the TU, the GW250 is powered by a twin cylinder 250. Interestingly, The front brake rotor is mounted on the left side of the wheel, where as most single side-front brakes are mounted on the right. not that it affects performance, but its a funny little tid-bit. thats...really about it to be honest. and finding one. ive never seen one on the road. This is the bike that I learned to ride on. Very interesting little machine, full of GREAT engineering ideas! For example, lets NOT bolt the carb to anything, and have it held in place by the airbox and the rubber boot on a VERY vibe-y 500CC single. Once I was able to reinforce that (as it was going through boots every 1000km) absolutely worry free bike. made a good noise, handled well, i was getting 80MPG, and very fun to work on. It rode remarkably well for a Harley product, turn in was nice and crisp, and it made a decent noise. Also, they attract a lot of attention. I remember one time, I took my baby blast to a bike meet along with a friend of mine on a BMW R1200GS ADV anniversary edition. The little thumper stole all of the attention. no one was looking at the big, bad, Bavarian machine next to it. My buddy didnt speak to me for 3 days after that. Oh well. maintenance free belt drive.NO CLEANING OR OILING! Build quality...left something to be desired. ^My personal Buell Blast, 3 days before I sold it. 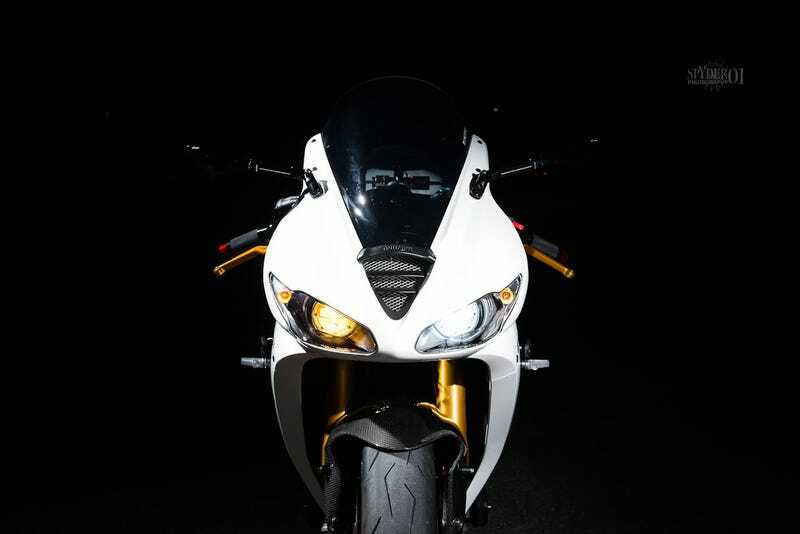 A naked Honda CBR300R. Re-read what I said about the CBR300R, and it all applies here. interestingly, it ONLY comes with ABS. no non-ABS option. huh. Naked version of the hyosung GT250R. Missing 1 disk on the front. Not much difference other then a cheaper price tag. Dual sports: These are more or less street legal dirt bikes. They are incredibly lightweight (often under 300LBS) and very high up. this makes these the drag racers of beginner bikes (weirdly). The have long travel suspension and are often bought by sportbike guys as something else to putt around on, head up that trail that we saw on the sporty machine. Of all the machines, these will probably last the longest, as much over 400CC becomes a little heavy and cumbersome for true single track riding. By far the most popular in the states, as it is the only sold stock in a supermoto configuration (17inch street bike sized wheels, street tires) The 400 is actually quite powerful, at 40~ HP and 317 lbs, its not an incredibly slow bike. It can definetly wheelie off the line, so this is not a bike for someone who has NO idea how to control a clutch. On the bright side, its coming from a motorcross bike, so the chances of it getting incredibly banged up are slim to none. , so this bike I would recommend for someone that drives a stick or is used to higher performance cars. the 200CC version is only available as a dualsport, and its not remotely as powerful as the 400. Hondas entry to the dual sport. with their CRF650 being the MASSIVE hit that it was, they gave it a little brother with better suspension. huh. the cheap version of the WR250. never seen one, in dealers OR on the road. ok, I did NOT realise that Yamaha had so many contestants in this category. You might recognize this bike, or as its commonly known, the big wheel, if you took a MFS course in Ontario. light weight, big tires to float over sand, But too slow for the freeway. the baby brother to the famous KLR650. This bike is closer to the yamaha Xt250 then the WR250. small, cheap dual sport meant you get you to the trails and through them. cruisers: these are by far the least performance oriented of the bikes, Usually trading HP for noise and torque, as well as being the heaviest bikes here. By far and away the most powerful bike here. the motor is based of a ninja 500, re tuned for more mid range and torque. But, the bike being so long and heavy in comparison to the ones so far, its really go about the same performance numbers. sport bike motor. Will not sound like a cruiser. the smallest cruiser on this list, the little 250CC rebel made do with a tiny parallel-twin tucked away in its chassis. Lightness plus a low seat hieght makes this a very popular starter bike among women. no v-twin, no v-twin noise.